Whether you’re a weekend warrior or competitive athlete, preparation is crucial to maximize your workouts and gains. This post is inspired by the passing (and completion by two of the staff!) of the New York City Marathon. While it is crucial to have a proper training plan in place, other considerations are also important. If you’re training long distance, make sure your glycogen stores are supplied, meaning you need your carbs! Hydrate and fuel the body to replenish what was used up! To learn more about Dedham Health, visit our website, here. 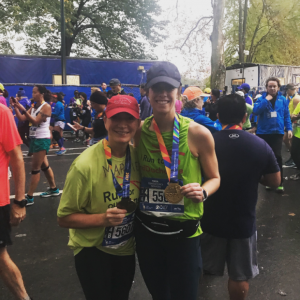 -Meghan J., Physical Therapist at Dedham Health and completer of the 2017 NYC Marathon!